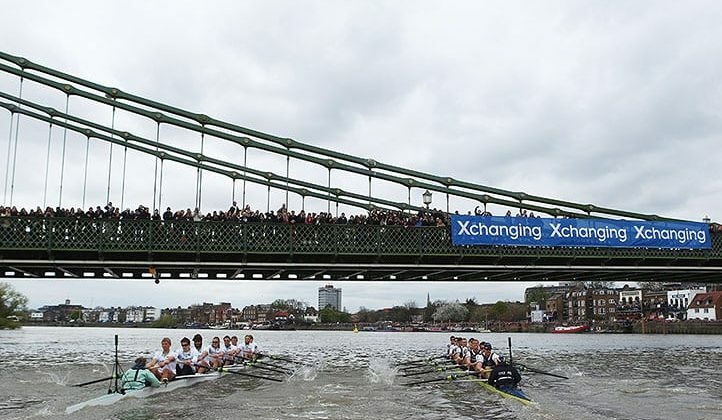 The annual Cambridge vs Oxford boat race takes place on Saturday 24th March. Each university fields a men’s and women’s team of 18 participants to take on the gruelling 4 mile upstream row from Putney to Mortlake in South West London. Last year’s men’s winners Oxford took their 80th win in overall and are only 2 behind their opponents, whilst Cambridge women claimed their 42 victory and are 12 ahead of Oxford. Each crew is made up of 8 rowers and 1 cox, all of which are non-professionals and students of their respective universities. Charles Merivale, a student at St John’s College, Cambridge challenged a friend Charles Wordsworth of Christ Church, Oxford to a boat race at Henley-on-Thames in 1829. Despite initiating the race, Cambridge were easily beaten. It took 7 years for the next race to take place, this time at a different venue, Westminster to Putney with Cambridge the victors. Over the next 2 years, there was a disagreement over where the race should take place. Both teams preferred their winning locations, so no racing took place. Following the formation of the Oxford University Boat Club in 1839, racing commenced between the two universities. The women’s race first took place in 1927, although it was not a race as such. Located on the Isis in Oxford, none of the boats were in the water at the same time. Instead the crews were judged on their speed and their ‘steadiness’ over a 0.8km stage. It wasn’t until 2015, when the men’s and women’s racing took part on the same day using the same course. The Championship Course, as it’s sometimes referred is 4 miles and 374 yards long. It stretches from Putney, passing through Hammersmith and Barnes to Mortlake following an S shape. The start and finish lines are marked with the University Boat Race Stones. The club’s presidents flap a coin in traditional manner to decide which side of the river they want to race on. Overall, there have been 7 sinkings in the boat race. 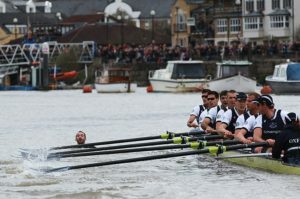 In 1859, the Cambridge men’s team became the first crew to sink, then again in 1978 and 1984 when they collided with a barge before the start of the race. Oxford sank in 1925 and 1951. Bizarrely in 1912, extreme weather conditions caused both boats to sink. The 2012 boat race witnessed Australian protester Trenton Oldfield jumped into the river and swam between the boats. He claimed to be protesting against spending cuts and the erosion of civil liberties and a growing culture of elitism within British society. For this, Oldfield received a 6 month prison sentence and a £750 fine. The race is viewable from both sides of the river along the full length of the course but in particular Putney Embankment, Hammersmith and Barnes and Dukes Meadow and Chiswick Bridge. There are also two fan parks set up at Bishop’s Park and Furnivall Gardens. Next Post:What to do over the Easter weekend?